As Chevrolet prepares to launch the most significant update to the Corvette since 1963, many enthusiasts have been trying to determine where the C8 mid-engine Corvette might be revealed. Many of the pundits and enthusiasts thought they were going to see it in January at the North American International Auto Show in Detroit while we were originally leaning towards seeing it at the New York Auto Show. Both dates seemed plausible at the time, but then came news of a potential issue with the C8 electrical system with GM Authority saying the team was looking at a six-month delay and so the reveal would be held at a stand-alone event sometime during the summer. So if we go with the pretense that Chevy is going to launch the C8 Mid-Engine Corvette at a stand-alone event this summer, we think the best place to do it would the at the National Corvette Museum’s 25th Anniversary Celebration at the end of August. I’m not completely sold that Chevrolet would be so bold as to launch the Corvette at the Corvette Museum, but after thinking about it for the last couple of days, I have come up with five great reasons why it should. We hear people say that Chevrolet would never launch a car in Bowling Green because there would be no national or international auto media to cover it. We beg to differ. The national automotive magazines and blogs have been covering news and spy shots of the C8 Corvette since it first broke cover four years ago disguised as a Holden Ute. Since then countless spy shots and renders have been presented and we are sure they see huge traffic numbers whenever the C8 featured. The Chevrolet Corvette is an automotive icon and is one of the few American cars to make the leap from being “a car” to being celebrated in pop culture with songs, movies and TV shows. It’s as American as baseball, hot dogs and apple pie as the old tag line when. Like the Kevin Costner movie about baseball, no matter where Chevrolet throws the reveal party for the C8, you can bet the press will be there. As someone who has been to several auto show press days, I can tell you that the journalists who fly in to cover it usually have a whole slate of different cars and press conferences to cover on their schedule. So while the C8 Corvette is expected to make a big splash no matter where it’s revealed, for many journalists covering the show, it’s not the only story out there. With an exclusive reveal at the NCM in Bowling Green, you have a captive audience of journalists who are there for one story and one story only…the reveal of the C8 Corvette. The National Corvette Museum hosts the Anniversary show annually, but every five years something special occurs as Corvette enthusiasts from all across the country join the national Corvette caravans for the drive to Bowling Green. With this year being the 25th Anniversary of the NCM’s opening in 1994, organizers are expecting anywhere from 7,000 to 10,000 Corvette enthusiasts. It would be a double-bang for Chevy’s promotional dollars by having a huge contingent of Corvette owners in town the same weekend as the C8 reveal. How rare is it where you can host an automotive reveal with the ability to make a first impression with those who matter most? While most owners may not be able to attend a live reveal event unless a suitable location could be found, the fact that owners could see the cars immediately at the NCM the same weekend would be a game changer for Chevy. 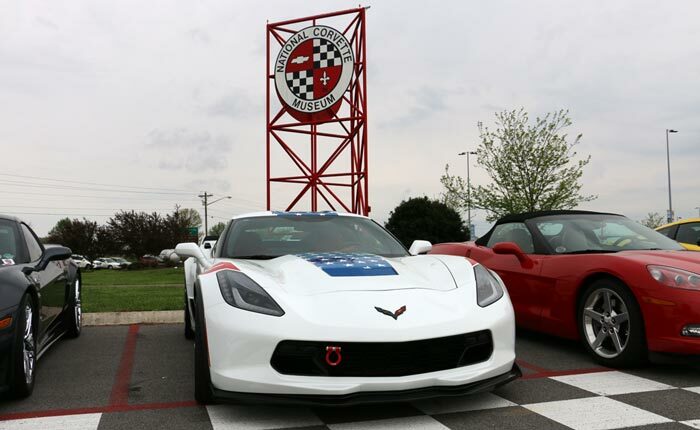 Corvette enthusiasts are so lucky to have the Corvette Assembly Plant, the National Corvette Museum and the NCM Motorsports Park all within a stone’s throw of each other. Each venue tells a part of the Corvette story but combined the three offer something that no other car manufacturer has at its disposal. Those journalists who do come for the reveal could be enticed to stick around and check out the whole story with a tour of the assembly plant and driving events at the Motorsports Park. Every day it seems like there’s a new rumor about some potential issue with the C8. Just this week on the Corvette Forum, a moderator is saying there’s a problem with the DCT transmission. Who knows, but let’s face the facts here. We need this Corvette to have the most successful launch ever if it’s going to succeed. A later launch date gives the engineering teams more time to correct the issues that always seem to appear in the last moments of testing. What would also be really great is that with longer lead time, if Chevy could then condense the time period between reveal and ordering and capture that new enthusiasm from all those Corvette owners at the show by opening up orders as soon as possible. So there are our five reasons why Chevrolet should consider the National Corvette Museum’s 25th Anniversary Celebration for the reveal of the C8 Corvette. For the automotive press, many of the reveals these journalists attend aren’t very memorable. Hosting the C8 reveal in Bowling Green, surrounded by Corvette owners and with the backdrop of the Corvette Museum changes the script and makes it more than just a press conference at an auto show. Most Corvette owners will never attend a new model reveal, so Chevy has an opportunity to create a very special weekend that will be remembered by Corvette owners for the rest of their lives. What do you think about a C8 reveal in Bowling Green? Would that make it more likely that you would attend the 25th Anniversary show at the NCM? If you think there is a better “stand-alone” event during the summer that makes more sense, let us know! Fall deliveries. Why? Because the first Corvette was revealed in NY. Also it is the last major venue of note, especially with all the hype (sketches, blogs, etc.) already out there. C8 prototypes have already been spotted being tested all over the country, it is high time for a Spring reveal. The Geneva Auto Show might also be a very good choice, given that the C8 will almost certainly be a world class contender. It might even beat some well-known marques at their own game. Geneva would be a good place to throw down the gauntlet on a world stage, because the whole world would be watching. Both Kenneth Gutwein and George C. have very excellent and valid reasons for their point of views. But being a corvette owner for over 50 years this production auto started in America, bought primary by Americans and continues being supported by all fans of the corvette. Bowling Green is the birth of all designs, production and home to all corvette owners. In our corvette hearts we call home Bowling Green! If G.M. waits until August for a revel the 2020 Corvette we won’t be able to buy one until maybe January 2020, so G.M. can sell all of the C 7s. I expected to be able to have one by end of August, WOW. GM is not going to reveal the C8 at the NCM’s 25th Anniversary. This is to small of an venue to show case the C8. It’s going to want a large show that will have media from all over that will give it world wide coverage. The only people that have an interest in the NCM bash are Corvette owners. August also seem to be an odd time of the year to have a new model car release. It should have been revealed in Detroit last month. But since it wasn’t, Bowling Green is the next best option. Being a Corvette owner since 1972 ( 5 in all ) I do think Bowling Green would be an absolute smash hit for the C8 introduction. I live in Washington state and still find time to go there every three years or so and am always impressed with the whole of things. Plant, museum, and now also the race track. This would be the reveal of a lifetime. An event unparalleled. Go for it. 3. Between 7,000 to 10,000 Corvette Owners Will Be In Town. Very good reason as to reward Corvette owners but probably wont happen. I agree with George at Geneva only because I agree it would shake up the more expensive RE car world and show that America can do it (GM, let’s not talk about GM). I guess the big question is did they fix the electrical problems? Not if or when but can they at this time. I hope the final rim design is not revealed until the big reveal and that the reveal shows a C* with roundish like tail lights. Yea, just dreaming. There has been alot of remodeling work being done at the NCM tour entrance. You never know! I believe the NCM’s 25th Anniversary in Bowling Green would be a great spot. A little leak here and a little leak there and suddenly you have everyones attention. I think they should open up the plant vehicle exit and parade one of every color and trim level over to the front of the museum There is a lot of pavement they could drive them around on. You have Corvette owners from all over the US, Canada and even farther than that in town. That would be a fitting thank you to the Bowling Green Assembly Plant. They’ve been born there since June of 1981. Well over a million Corvettes have been produced there. Let the plant be the one to unveil the biggest change ever made. They build them they deserve the recognition. [email protected] would also be another venue to do it at? To hell with NYC or Geneva. The NCM would be perfect. It is currently the Mecca for all things Corvette. As far as it being “too small”??? It’s 2019, you can broadcast in 4K live over your PHONE. Rest assured, the world’s media will find its way to wherever the reveal is announced, and Bowling Green (AND Chevrolet) would find a way to accommodate everyone. Honestly, this game has gone on for long enough now, that I, personally, just want it to be released. Whether it is revealed at the NCM, Geneva or New York, it would be nice to just FINALLY have the C8. [SPIED] Is This the Mid-Engine C8 Corvette’s Front Axle Lift System in Action?